Petalcorin and Alvarado meet for IBF crown! One of the best divisions in the sport right now is the Light Flyweight division, which is stacked with talent, has been matching the top fighters against each other consistently and it has such a varied array of styles that there really is something there for everyone. This coming Monday fight fans in the Philippines get another great bout between top divisional fighters as local hopeful Randy Petalcorin (29-2-1, 22) finally gets a world title fight. Sadly for Petalcorin he will be going up against one of the division's most feared fighters, Nicaraguan puncher Felix Alvarado (33-2, 29), in a bout for the vacant IBF title. The Filipino is a 26 year old southpaw who has been around the professional scene for close to a decade. His career has promised a lot, but the reality is that he's yet to score a really big win and live up to the expectation that many in the Philippines have had for him. Petalcorin would scored 5 straight stoppage wins to begin his career before coming up short against a then unknown Marlon Tapales, who would later go on to claim the WBO Bantamweight title. He would rebuild from that loss by advancing his record from 5-1 to 23-1-1 (18) before a controversial loss to Omari Kimweri in Australia in 2016. Sadly the 19 fight unbeaten run between those two losses lacked in terms of notable wins, with perhaps the best of them being over Walter Tello, Ma Yiming and Samartlek Kokietgym. Since losing to Kimweri Petalcorin has bounced back with 6 straight wins coming into this bout. In the ring Petalcorin is a razor sharp boxer-puncher. He's shown those skills through his career and few will question his smoothness in the ring. He can switch from head to body with ease, can counter punch excellently and he looks amazing when he's facing over-matched foes, as we saw when he travelled to China and demolished Yiming with smooth combinations and brilliant clean punching. Sadly though there is a feeling that Petalcorin looking great against lower tier fighters says more about his competition than about him. If Petalcorin can step up here and perform as good as he has against lesser men then he has a genuine chance, but this is a big step up for him. Nicaraguan fighter Alvarado has been a professional since 2010 and the 29 year old has built himself a reputation as a man to fear. He would begin his career by running up 18 straight wins, 15 by stoppage, whilst fighting mostly on the Nicaraguan domestic scene. In 2013 he would step up massively and face Kazuto Ioka for the WBA Light Flyweight title, though came up short against the Japanese fighter. The following year Alvarado would suffer his second loss, losing in a competitive bout against Juan Carlos Reveco. Since those losses Alvarado has been on a tear going 15-0 (14). This time his run hasn't just come against domestic level opponents but also fringe contenders, such as Yader Cardoza, Jose Antonio Jimenez and most notable Fahlan Sakkreerin Jr.
As a fighter Alvarado can be out boxed, he out manoeuvred, out sped and out thought. However he's a massive puncher, an all out monster on the front foot and he seems to have a solid engine with a very gritty and determined toughness. He can be his, though has under-rated defense, and boy can he punch himself. He's crude, a little clumsy, a bit open and pretty technically limited, but he is such a dangerous fighter that few will take risks against him, especially given that his power is potent to both head and body. We believe that if Petalcorin can box to his best, for 12 rounds, uses his legs and jab and never trades with the Nicaraguan, he can take a decision here, especially with the home advantage. It is however a massive ask and Alvarado will be after him from the first bell, and will be looking to break down the Filipino. Sadly for Petalcorin we suspect the power, toughness and drive of Alvarado will be too much in the end. No matter who wins here we're assured of some great bouts down the line, with the division being so packed with talent that the winner will struggle to find an easy defense any time soon. Just under 3 years ago a young unbeaten Japanese fighter shocked the international boxing public by dethroning the long reigning Thai Oleydong Sithsamerchai. 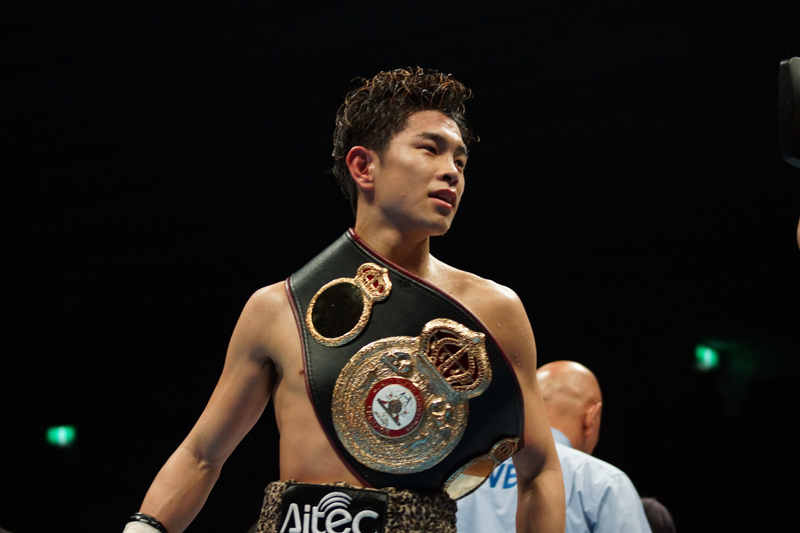 Although Oleydong was struggling with 105lb weight limit few, outside of Japan, had given the then 6-0 Kazuto Ioka more than a slim chance to claim the WBC Minimumweight title. As we all know though Ioka would stop Oleydong and claim the world title. Since beating Oleydong back in February 2011 Ioka (now 13-0, 9) has become one of the dominant fighters in the lower weight divisions. He has unified the WBC and WBA Minimumweight titles and moved up to Light Flyweight where he immediately captured the WBA title. This New Years Eve see's Ioka, fighting for the third successive year on December 31st, attempt to make the 3rd and possibly final defense of his Light Flyweight. Following back to back victories against limited but experienced Thai's Ioka is now expected to face a genuine test as he battles Nicaragua's unbeaten Felix Alvarado (18-0, 15). It may not be the Nicaraguan we all hoped Ioka would get in to the ring with this year, he's certainly in for a tough night to end the year. Ioka, since claiming the WBA Light Flyweight title on New Years Eve 2012 has looked very impressive. He took apart Wisanu Kokietgym back in May before stopping an out classed Kwanthai Sithmorseng in September. Those fights however were against men who really didn't deserve a world title fight despite having a combined record of 86-9-3, neither was great and in fact neither was expected to test Ioka in any way at all. In Alvarado however we have someone who looks like a bit of a monster. Alvarado is offensively minded, strong and comes to fight. If you try and stand off against Alvarado he is happy to walk you down, show you angles and then unload heavy shots in your direction. It's not always the smoothest of work but it's proven to be effective as he switches from head to body in an attempt to beat up his opponents. Whilst Alvarado can be out boxed and can be made to look basic by some fighters, only 2 men have ever gotten close to beating him. Arnoldo Solano, who lost a disputed majority decision to Alvarado, and Eliecer Quezada, who lost by a very narrow unanimous decision. The worrying thing for Alvarado is inexperience. Yes he has more fights than Ioka but his 18 fights to date have only accounted for 51 professional rounds. Less than 3 a fight. Alvarado has gone 10 rounds just once, and has only gone beyond 3 rounds thrice. With 7 opening round KO's and 15 KO's inside 3 rounds he's been used to getting opponents out early but when he's gone beyond 6 he has struggled with pacing. Ioka, with just 13 fights, has already gotten 96 rounds under his belt which is more than 7 rounds a fight. He has also gone 12 rounds twice and 10 or more rounds on 4 occasions, including his memorable encounter with Akira Yaegashi. That is quality experience and something that gives Ioka a real edge here. Although less of an offensive machine Ioka is wonderfully skilled with the ability to go forward, box off the back foot and pick his shots at will. He's one of those fighters who always appears to have that little bit of extra time and he uses it to great effect with one of the most beautiful straight right to the body in the sport today. He's not a monster puncher but he is a very clean puncher and his shots, from the jab to the uppercut are all delivered excellently. Going in to this fight the key is who will be able to dictate the early tempo. If Alvarado can get on to the inside this could be a real war for 3 rounds with both men forced to take hard shots. If Ioka is still standing after 3 rounds however it's going to be very hard for Alvarado to get a victory with Ioka drowning him. Those first 3 rounds are the key for Alvarado. If Ioka can control the pace and distance for 3 rounds with his jab and movement he'll wear Alvarado down in the second half of the fight before finishing the Nicaraguan, probably with a body shot. Whilst the first 3 rounds are the key for Alvarado we tend to think that the following 3 are the key for Ioka. If the Japanese fighter is still standing after 3 then rounds 5 and 6 particularly will see him taking over the fight. It's the fact we have 2 very different scenario's that make this so interesting. One thing is for sure though, we'd be very shocked if this goes 12. Interestingly the story coming out of Japan is that Ioka will be stepping up to Flyweight next year. The strong rumour is that he will be targeting WBC Flyweight champion Akira Yaegashi in what could potentially be another FOTY contender, like their first was in 2012. That would see this title becoming vacant, if Ioka is successful. With a number of fighters already wanting to get their hands on the belt including Naoya Inoue and Ioka's stablemate Ryo Miyazaki we may well see several great bouts coming as a result of this one. For those wanting to tune in to this bout, it'll be on TBS in Japan and there is also talk about it being televised in Alvarado's homeland of Nicaragua. Unfortunately, once again, no Europe or American channel appear to have picked this up.